The acclaimed Age of Empires franchise is taking the first step in the free-to-play market with Age of Empires Online, a game developed by the makers of the hit series Dungeon Siege, Gas Powered Games. This free MMO retains all the elements that made Age of Empires one of the most successful strategy series ever, while adding a compelling cartoon look and several role-play features to keep players enthralled in the game. There’s a hint of The Settlers to it, but the spirit of the original Age of Empires remains present. 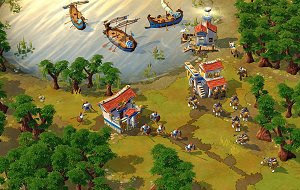 Create your village and watch it evolve into a magnificent empire, while fending off rivals and trading with friends.